Fruits and vegetables are the core promoters of good health on the Med-DASH plan. They are chock-full of antioxidants, fiber, vitamins, and minerals and can be super delicious, along with having the side benefit of being very filling. The more different colors you choose, the more health benefits you will reap. You can choose fresh, frozen, or canned (preferably fruits in low-sugar syrup, or low-salt vegetables), if that fits better into your budget. Berries are especially wonderful. Those intense reds and blues are associated with the very powerful antioxidant anthocyanin. 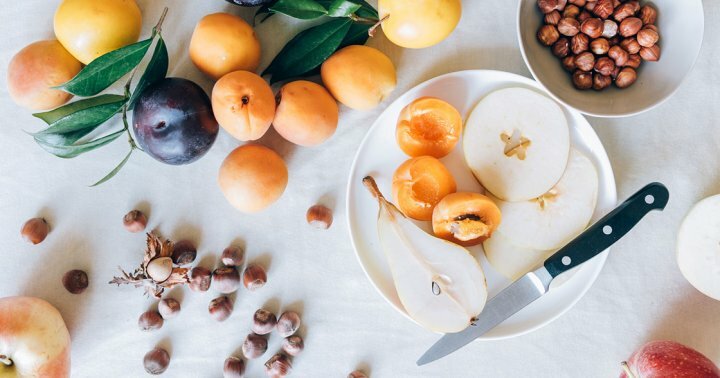 Stone fruits (peaches, plums, apricots, cherries, pluots) are very rich in soluble fiber, which slows your absorption of fructose (the fruit sugar) and nourishes good bacteria in your gut; these fruits also contain anthocyanin. Citrus fruits are rich in carotenoids, along with vitamin C.
As mentioned earlier, grapefruit can react with some medications in your body, so talk to your physician to see if you should limit grapefruit in your diet. Even though we don’t want to overdo them, both sweet potatoes and regular potatoes are rich in potassium and vitamin C. Orange-yellow fruits and vegetables have lots of beta-carotene, along with other powerful antioxidants. Green leafy vegetables also contain lots of carotenoids, although they are hidden by green chlorophyll. Tomatoes, red bell peppers, and watermelon are rich in lycopene.